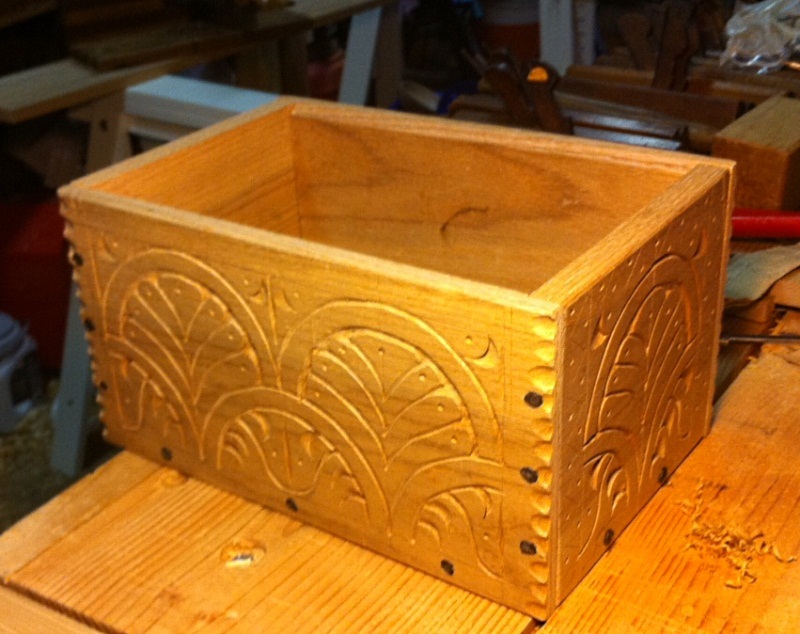 As chronicled in the following posts one, two, three, I’ve been working on a carved box in the style of a 17th century pattern. Inspired by Peter Folansbee, and his blog I’ve gone down a pretty deep rabbit hole, and I’ve been having a blast with it. I’m planning to continue the practice carving starting with my next project, possibly a saw till, and keep at it. While I am happy with what I put together, it only showed me how much I had to learn. I’ve been doing lots of research, and as usual buying books. I still can’t find Chinnery, but I do have it on loan from the library right now, and it’s a gold mine of pictures and information. Picking up where I last left off with the carved sides and ends, I now had to put together these carved boards into a box of some kind. I started by trimming the boards to their final size, which took some work to figure out as I didn’t have any good wide boards for the bottom or a possible lid. I had to rethink my design quite a bit, and finally settled on a shape. 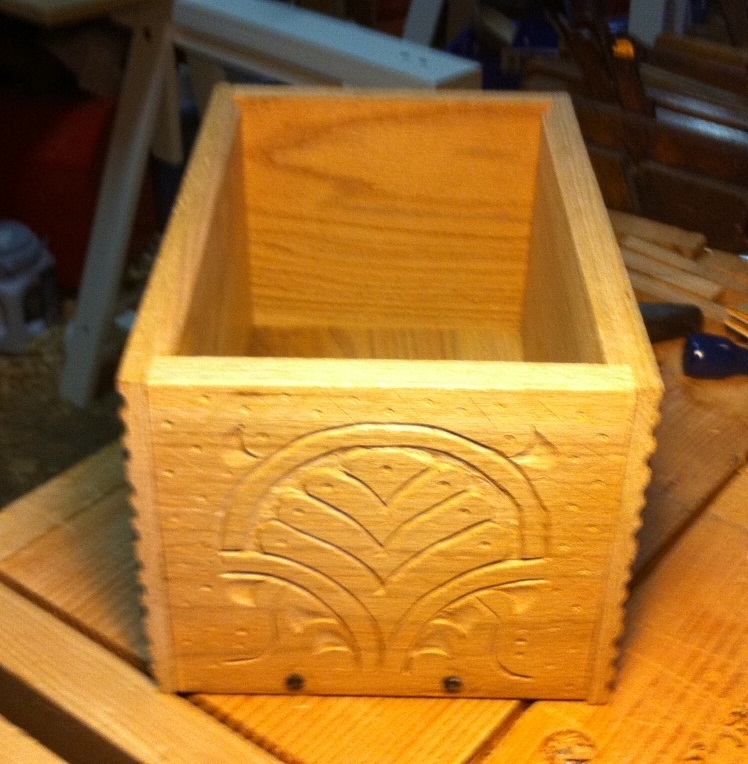 It had been going to be a box with a lid and molding around the bottom edge, but instead I opted to simplify things quite a bit. It’s now going to be for my carving tools which I’ve started gathering a number of. 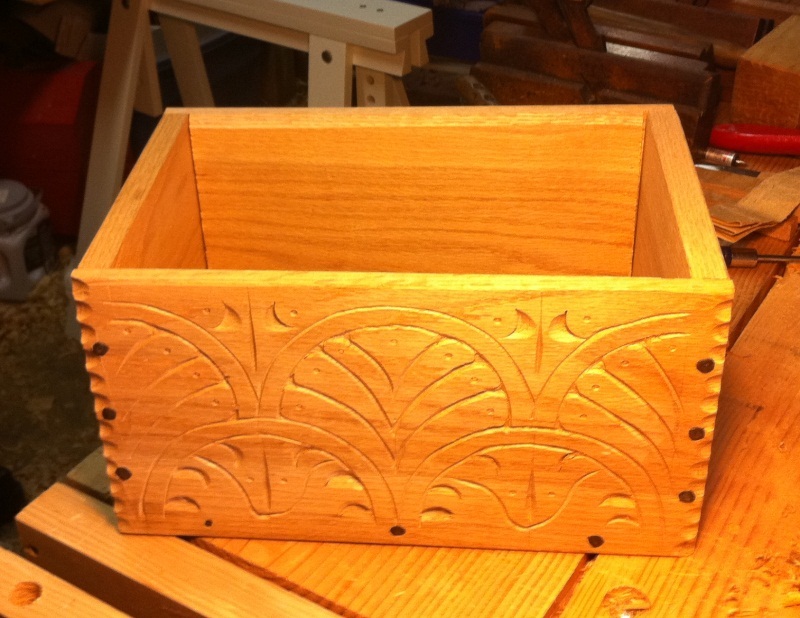 After I had the sides trimmed, I used my moving fillister plane and a rabbet plane to make some rabbets, a simple procedure I nonetheless made more complicated that it needed to be. My fillister plane needs a bit of adjusting I think, so I had to do a lot of clean up with the rabbet plane. It’s something I need to do a few more of before I feel comfortable doing it. Next I needed to make some holes for my nails. I decided to try something I’d read about, and use a “birdcage” awl. I took a cheap ice pick I’d gotten from Harbor Freight, and using a grinder made the tip a four sided pyramid instead a rounded point. Using this I twisted it back and forth in one spot, and it made a rather nice hole. It’s a old trick apparently, but it’s not too common from what I’ve around the blog-o-sphere. 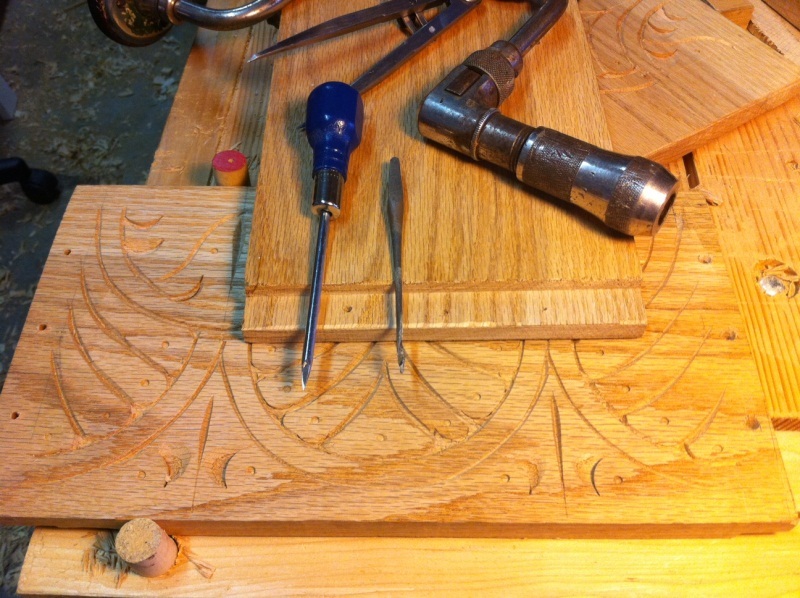 I also tried out my gimlet bits that I picked up ages ago at a tool show. 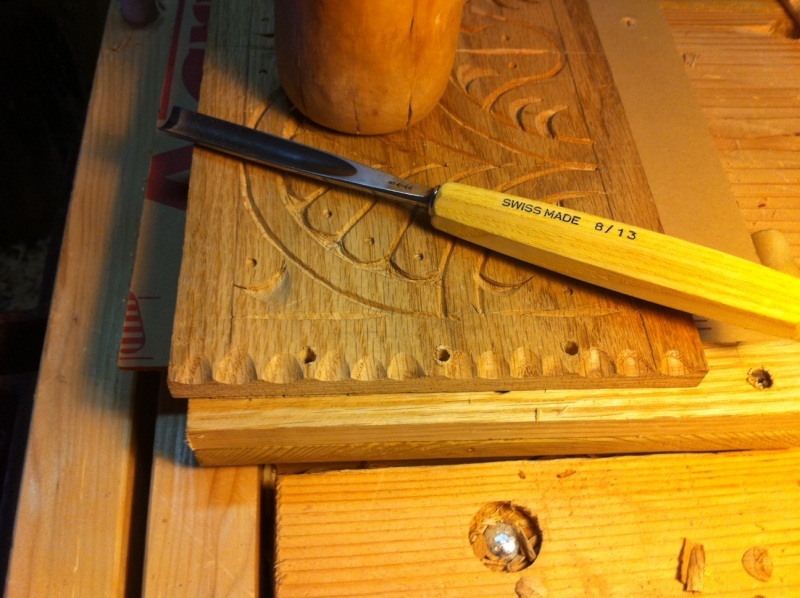 Those worked well enough, but took a long time to get started, so I finally settled on a combination of awl and gimlet bit which was fairly quick, especially when I did a whole series of holes. Once all the wholes were bored, I put some finishing touches on the edges with a gouge. I’ve seen this done on quite a number of 17th century boxes, and it was quick and easy to do. So now I had my bottom board cut, sides trimmed, and everything prepped. I nailed it together with some Wrought Head Nails I ordered from Rockler. They gave it a nice touch. I’m not sure if they are accurate, but my box isn’t really going for full period anyway. After I finished I brought it up to show the family. 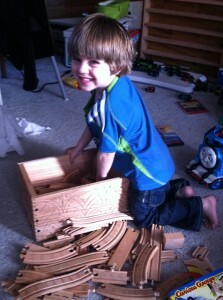 My son immediately put it to it’s proper use, putting wooden train tracks into. Love the box. I think its great that even though you spent a lot of time and effort on this box your not wrapping it up in cotton wool – it’s being used! I’m sure your family will use and keep it for many years to come.